Crayfish are small crustaceans that inhabit freshwater streams, creeks, swamps, and ponds throughout North America. 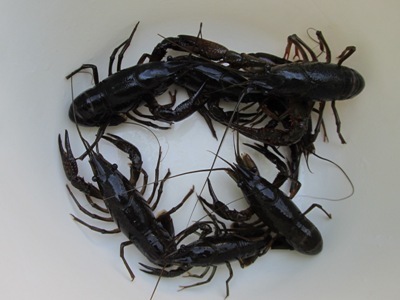 Also known as crawfish or mud bugs, these aquatic creatures are sometimes harvested for food or fishing bait. Fishermen use a variety of methods to catch wild crayfish. In many creeks and streams, crayfish can be caught by hand with small dip nets. Experienced harvesters locate their targets by searching under rocks and other areas where crayfish tend to hide. In swamps, ponds, and slow moving creeks, traps are the most common tool for harvesting crayfish. A variety of crayfish traps are popular, including square, rectangular, or tube shaped traps. Crayfish traps should have one or more funnels and an access door for adding bait as well as removal of crayfish. Crayfish are attracted to baits such as fish carcasses, chicken parts, or other easily attainable meat. Baits are usually more effective when placed in a small mesh bag and tied in place within the trap. More elaborate traps have bait compartments which offer a built-in method of securing the bait. Crayfish traps are usually most effective when allowed to soak for 2-3 days. This gives the bait time to decompose, thereby attracting greater numbers of crayfish. The success of crayfish traps can also be dependent on weather or water conditions. In some areas, trapping seems be more productive around the full moon, after a heavy rain, or when barometric pressure changes suddenly. When harvesting crayfish, it is important to take proper care of live individuals. Most species of crayfish will not tolerate rough handling, excessive heat, overcrowding, or direct sunlight. Rather than placing large numbers of crayfish together in water, some fishermen store them in a damp burlap or cotton bag, out of the sun.